Fly Trap sports 7 attack arms, each designed to grasp the opponent in a crushing embrace and then to alternate sets of limbs to pummel attack the trapped foe. Each limb is highly vulnerable to attack, or plain just breaking off against the shell of the enemy, but with so many arms the expected losses are acceptable. 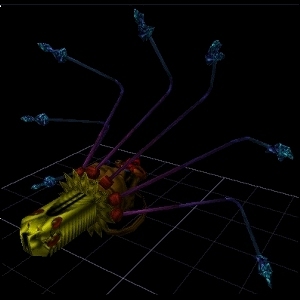 A Bladsk Grond protects Fly Trap from attackers once they are embraced and also acts as a secondary level of attack should all 7 arms be destroyed. Fly trap operates with a Abhasa Cephalomind controller unit and requires the power of only 2 Cyn Heart energy pods.